Have you ever heard of strewing in the context of homeschooling? I discovered I was doing it before I learned it had an official term such as the art of strewing. 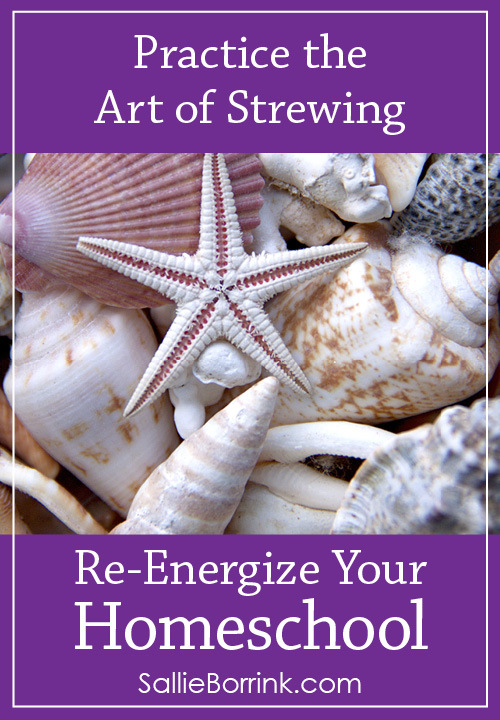 I think strewing is a valuable concept that can do a lot to re-energize your homeschool, especially if you currently have a very mom-centered or mom-driven approach to homeschooling. My definition of strewing is leaving out things for Caroline to discover and explore on her own. It could be anything I think she would find interesting… seashells, rocks, a book of poetry with lovely illustrations, flash cards of famous places, a magazine, or a new type of craft. For example, a few weeks ago I got out the various Calvin and Hobbes anthologies we have and put them in a pile on the coffee table in the family room. No comment by me or David. But I knew she would be drawn to them. Sure enough she was and now most mornings before and after breakfast she sits down and reads them, often regaling us with retellings of what is happening. Strewing is also setting out a small bin of colorful flashcards about various topics (U.S. Presidents , animals , etc.) and just waiting to see what she finds interesting. Strewing is also rummaging through my craft stash and leaving some new supplies on her table in the learning room where she will discover them the next morning. Strewing, in my mind, serves a few different purposes. One, it takes the onus of Caroline’s learning off me to a certain degree. While I am her mother and her teacher, I want the responsibility of her education to gradually shift more and more to her. This is a small step in helping her become responsible. Two, it reinforces to her that she can explore without me and learn in the process. I’m pretty sure we’ve already made this point clear over the past few years, but it certainly can’t hurt to give her lots of examples of how she is empowered to learn on her own. Three, it gives me a break. As the work- at-home mom of an only child, providing her with something she can get lost in on her own for a certain amount of time is huge. Really huge. And, perhaps most importantly if you have a right-brained child who loves to learn and hates to be taught, it fits perfectly with her learning style. Sitting down with a right-brained child and saying, “Let’s look through these flashcards of the U.S. landmarks” can be a bit of a risk. Leave them out for the child and she’ll be telling you all about the interesting facts she’s reading on the cards. It just works for kids who are wired this way. The downside of strewing? It can be expensive, to be totally honest. I’d love to do more strewing than I do, but buying stuff to newly engage Caroline on a regular basis is a costly proposition. Other than the cost and taking the time to remember to strew regularly, there is no downside to strewing. It’s really a simple but powerful way to influence your child’s learning in a hands-off kind of way. 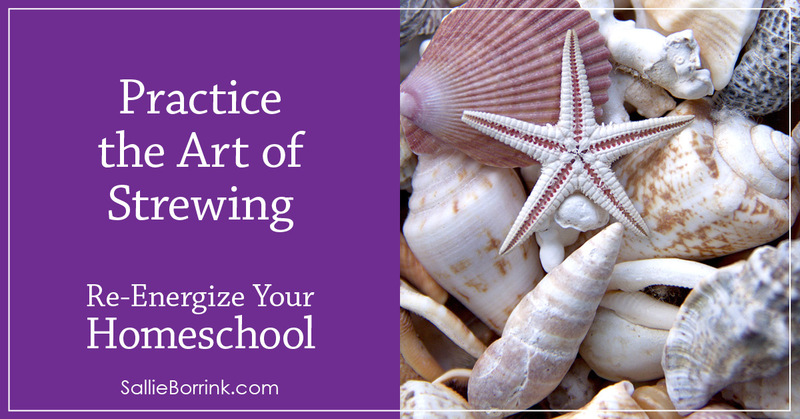 If your homeschool needs some re-energizing, I highly recommend doing some strewing. I think strewing is easier. I agree that it can cost a lot of money. I just used some of our tax refund to buy a bunch of books and dvd’s for kids to learn from. I have a library in my house–well, o.k., a few libraries, because there are bookshelves throughout the house. Every bedroom and the living room has at least one short one. My bedroom has two tall ones. Then there is a large space downstairs with 4 tall bookshelves. We love books. 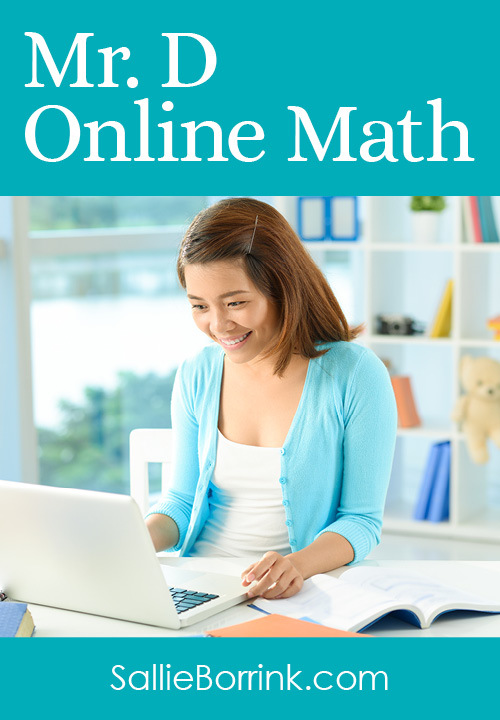 This is my version of strewing, to just buy educational books that look great on amazon.com and buy them for my library. I am my own family’s librarian, as I pick which books are purchased for it. My kid buy books as well, but they keep them in their rooms. The bookshelves in their rooms can be added to just by “checking out” (taking books off the main library shelves downstairs). I do think going to the public library is fun, but they cannot do that in the middle of the night, which is sometimes when my kids go check out the library shelves. Tee hee! It really is great to have your own library. I highly encourgage it. Shop at secondhand stores, library book sales, amazon.com and local homeschool buy and sale curriculum events. You will find great books, and sometimes for free or for 50 cents. The amazon ones can be 1 cent plus 3.99 shipping, which is commonly found. Just look for the used ones! This is great! And as far as the costs, I think we can come up with something. I find so much good free stuff. My neighbor had a full set of encyclopedias he wasn’t using! I am fortunate to come across so much stuff for free, but that just tells me, it’s out there. Maybe even starting a “Strewing material exchange” trade flash cards, National Geographic magazines, certain children’s story series, different science material. Even simple things like aluminum foil and straws! I think I may try to start a group like that here. 🙂 AWESOME!! Thank you!!! !